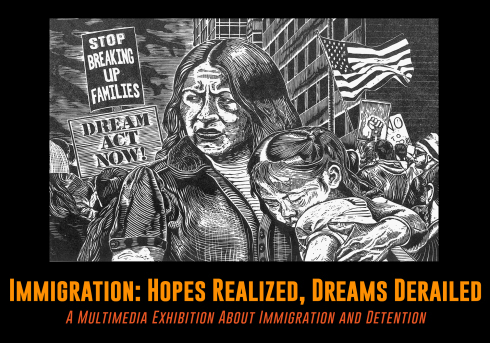 Immigration: Hopes Realized, Dreams Derailed is a multimedia exhibition about immigration and detention on display at the Spaceworks Gallery. Curated by art critic Susan N. Platt and mural artist David Long, the exhibit addresses the urgent issue of immigration from multiple perspectives. Spaceworks Gallery is open Monday – Friday 1 – 5 p.m., and 1 – 9 p.m. on the third Thursday. Free and open to the public. At the closing, August 17, the Spaceworks Gallery will have music, poetry, and performances, as well as immigrant rights leaders speaking about the essential contributions of immigrant workers and the oppressive conditions in the Northwest Detention Center. Participating Artists Include: Arni Adler, Pavel Bahmatov, Janice La Verne Baker, MalPina Chan, Maria De Los Angeles, Andrea Eaton, Christian French, Tatiana Garmendia, Ricardo Gomez, Deborah Faye Lawrence, David Long, Marilyn Montufar, Pam Orazem, Devin Reynolds, Blanca Santander. This exhibit is supported in part by the Washington State Arts Commission, Allied Arts Foundation, and Humanities Washington.